And there is even talk of Cabinet approving a National Health Policy including a right to health. 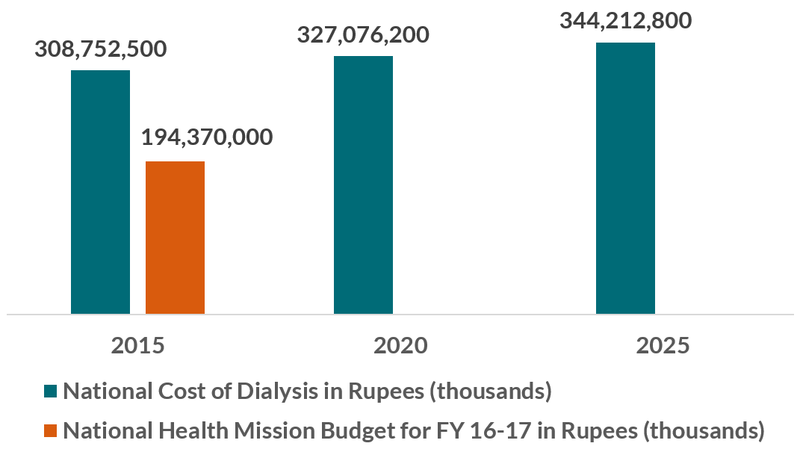 Fast forward to this year’s budget when the Indian government announced its intention to provide dialysis in every district hospital in the country. Kidney failure in India has doubled over the past 15 years; there are about 220,000 new patients with end-stage renal disease (ESRD) each year and the majority are poor. But if India actually funded and provided dialysis to the population in need, the entire Central government’s public spend on health might be consumed (see Figure). Dialysis, particularly hemodialysis or HD, is expensive. In India, one HD session costs about Rs 2,000 (USD$30), which adds up to more than Rs 300,000 per patient per year (USD$4,465). Of course, there might be economies of scale that could drive down prices and marginal costs over time, but the point is that little thought seems to have been given to the expenditure requirements and trade-offs that a dialysis coverage decision might generate for a health system committed to “UHC with equity”. Calculated using UN population projection data and Veerappan and Abraham (forthcoming) for prevalence rate of 785 per million population for three years. Multiplied projected prevalence by average cost of dialysis per patient (Rs 300,000). Projection is if all patients received average amount and frequency of dialysis treatments. Compared with amount Rs allocated in National Health Mission budget FY16-17. As in many other countries, politicians have decided what will be subsidized in an ad hoc way. With no clear criteria or explicit process for deciding what health services will be covered with public monies, the measure was simply announced in the Union budget, complete with a tax break for importation of dialysis equipment and a note that the initiative could be implemented through a public-private partnership. The possible result: implicit and unfair rationing of care—with spending consumed on a first-come, first-served basis, likely in urban areas. As former Health Minister of Maharashtra Suresh Shetty has highlighted, it is difficult to get qualified doctors and technicians to perform dialysis in rural areas. Further, while there is certainly need and demand for dialysis services, many Indian citizens still lack access to the most basic kinds of cost-effective health care: things like oral rehydration salts for diarrhea, vitamin A supplementation, treatment of depression or smoking cessation support, among many others, not least programs that could help prevent ESRD and its precursors (diabetes, hypertension) in the first place. Now that the decision has been made, authorities in India—and those in Indonesia, Pakistan and Nigeria who are moving ahead with similar initiatives—need to ensure that the dialysis program implemented does not consume the entire budget or crowd out other important uses of public spending on health, thereby working for and not against UHC aspirations. We suggest three strategies based on other countries’ experiences: (1) more systematic evaluation of options to inform coverage decisions; (2) more systematic attention to the ethical aspects of selecting patients who will receive dialysis in the context of a limited budget and supply constraints; and (3) more attention to cost-effective prevention and management of ESRD pre-cursors such as diabetes and hypertension. First, policymakers need to evaluate the cost-effectiveness of different kinds of dialysis to choose the most effective and least costly option for coverage. Thailand’s health system provides some insight: in the early 2000s, ESRD incidence increased and there was a push for inclusion of dialysis in the country’s Universal Coverage Scheme (UCS) benefits package. The National Health Security Office (NHSO), Thailand’s payer agency, subsequently commissioned nephrologists and policy researchers to evaluate the cost-effectiveness of different kinds of dialysis. Although their study found that neither hemodialysis (HD) nor peritoneal dialysis (PD) was cost-effective according to their standards, they determined that PD was more cost-effective than HD because PD had a home treatment option, whereas additional infrastructure and human resources were needed to treat patients with HD and HD can be costly for households (even if the service is free) because patients and/or caregivers still need to pay a lot for transport between home and a dialysis center 2-3 times a week. Based on this evidence, the NHSO opted for a PD first policy in Thailand’s UCS benefits package. This kind of analysis and decision is crucial for UHC given—as in Thailand—many nephrologists will own private HD clinics, and will likely advocate for extension of this model, in spite of the untenable costs that may have implications for equity. Attention should also be paid to how a government announcement to cover dialysis in whatever form can affect the price of related products; in Indonesia, for example, PD consumable manufacturers were considering price hikes once an official policy was announced, suggesting that government may wish to negotiate prices ahead of any decision-making. Second, the government should consider the equity, ethics, and social and legal implications in making decisions about who will benefit from the dialysis program. The approach in one hospital in South Africa is interesting. In 2010, after learning that white patients were almost four times more likely to be accepted for dialysis treatment than nonwhites at Tygerberg Hospital, provincial officials and medical professionals in South Africa created an official, transparent and accountable system to decide which patients would receive dialysis treatment on a priority basis, given the limited budget and capacity. This idea has been around for some time in the framework of Accountability for Reasonableness, but is receiving increasing attention in operational settings as in the South African example, among others. As India plans its dialysis program, it is important that guidelines are explicit for every step of dialysis selection and treatment, and that the ethical implications of such decisions are addressed and managed. Finally, to combat the staggering increase of ESRD, prevention is key. Rather than spending all of the funding allocated to kidney disease on tertiary care options, the Indian government must consider prevention efforts as an equally important, if not more important, priority. Dialysis is only a Band-Aid to the problem; risk factor prevention, diabetes management and screening programs and other prevention measures need to be implemented to stop the disease at its root, as the Prime Minister himself has pointed out. As in India, many low- and middle-income countries are struggling to meet the demand for renal dialysis and other relatively expensive treatments while still seeking to fill gaps in primary health care. Exchanging information and strategies for resource allocation and decision-making between countries is a start, as has been done in Asia under the leadership of the Health Intervention and Technology Assessment program in Thailand, in collaboration with the International Decision Support Initiative. And tracking and discussing what countries actually do—as in this blog post- is also important, and follows on our continued work on priority-setting, since the way in which health systems cope in balancing these demands has major implications for global health’s UHC dreams. Thanks to Anit Mukherjee and Yot Teerawattananon for their input on this blog post. HD uses a man-made membrane to filter wastes and extra fluid from the blood, while PD uses the lining of the abdominal cavity and dialysate solution to remove wastes and extra fluid from the body.